St Catherine, Hoarwithy, by John Pollard Seddon (1827-1906). c.1872-1885, though, according to Nikolaus Pevsner, it was still not at all complete by then, because it was still being decorated by "George Fox, no doubt the G. E. Fox of Eastnor and Longleat" (192). That work would continue, under Seddon's direction, until 1904 (see Sladen 86). 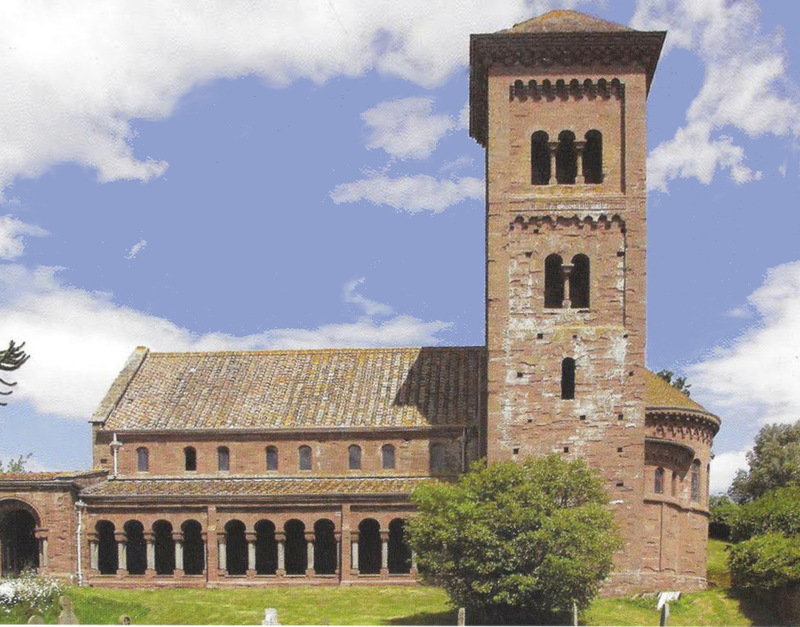 Pevsner found this Grade I listed church "extremely interesting," describing it as "Italian Romanesque outside, Siculo-Byzantine inside" (54). Seddon's remit, as proposed by wealthy local vicar William Poole, was to encase and improve upon an old brick chapel of 1840. It was a great chance for him to put his ideas into practice. The result was a new and dramatically different-looking building with much longer nave and a tall campanile, the main attraction of the village of Hoarwithy, a well-known landmark overlooking the Wye valley in Herefordshire. Of particular note is the cloister walk along the south side, as shown above. Visitors, having climbed up some steps from the road, find that the tower is open at ground level. The cloister then goes the whole length of the church before turning in through the south-west porch. "The cloister roof is red-tiled, the arches small and rounded and their capitals carry Romanesque motifs. On the floor are mosaics. Everything is quiet and charming" (Jenkins 314). 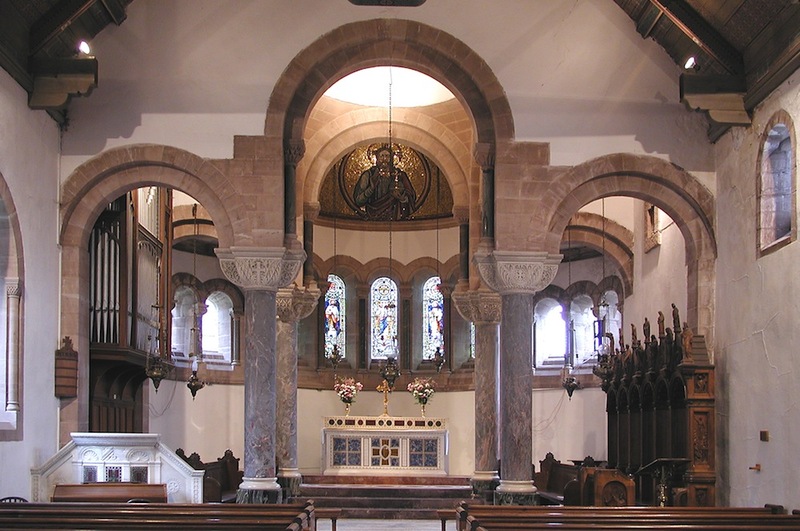 Teresa Sladen suggests that Poole may have given the work to Seddon because he had read the book; be that as it may, the interior is distinguished by this small-scale version of such grand and famous Byzantine-style churches as St Mark's in Venice or San Vitale in Ravenna (mentioned by Sladen and Jenkins respectively). Four impressive columns of grey Devonshire marble, with Byzantine capitals, support an inner cupola with wagon-vaults on either side; and looking down on the congregation from high in the central apse is the glittering gold mosaic of the Pantokrator. Sladen says that the effect makes this "one of the most exotic and un-English rural churches anywhere in Britain" (86). 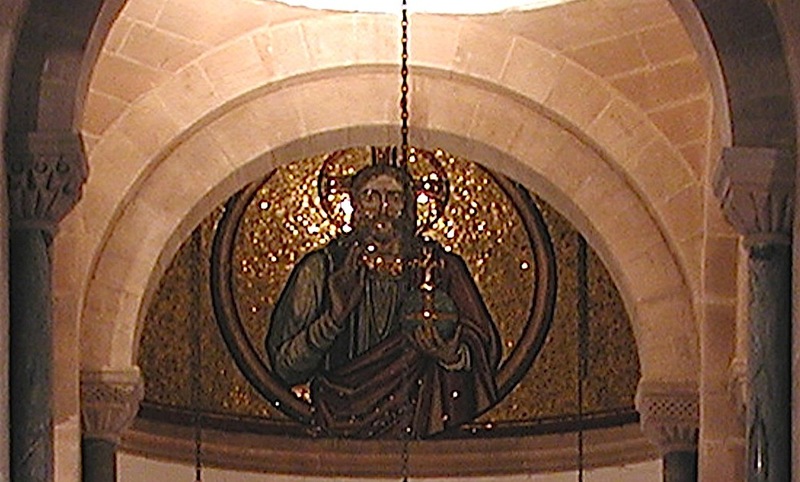 Left: Closer view of the apse mosaic. Right: The richly embellished altar. The mosaic-work and fittings that Seddon designed are all suitably sumptuous. 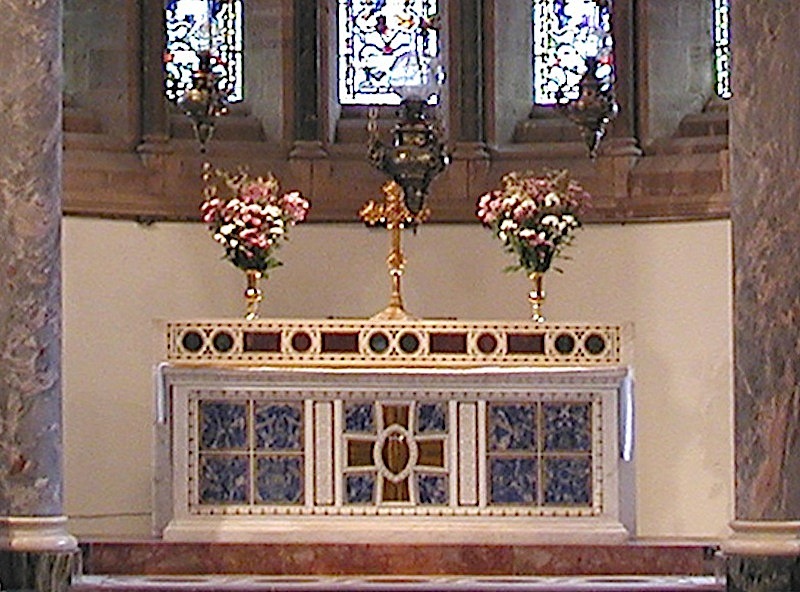 The pulpit, seen on the left in the second photograph, is of white marble, with "three maroon porphyry panels divided by plain pilasters under an acanthus frieze and moulded cornice" (listing text). The marble altar is similarly handsome, with a "brown cross between lapis lazuli panels and five consecration crosses on the mensa" (listing text). Above the altar can be seen three of the brass oil-lamps that hang in the chancel. There are two more on either side, seven in all. The carvings on the stalls as well as those on the capitals and elsewhere, and the stained glass windows, were probably designed by Seddon himself; the signature of Harry Hems can be seen on one particularly elaborate piece of wood-carving. Hems (1842-1916), was an important architectural and ecclesiastical sculptor with a large firm in Exeter: everything here was of the best. Unique in its campanile, cloister, grand columns, series of domes, and glowing central mosaic, St Catherine's is indeed "a complete work of revivalist art, rare for its date and an astonishing creation" (Jenkins 314). "Harry [Henry] Hems." Mapping the Practice and Profession of Sculpture in Britain and Ireland 1851-1951, University of Glasgow History of Art and HATII, online database 2011. Web. 25 November 2016.